Have any words to say? Want to send us a testimonial? Head over to our contact page and send us an email! Fantastic night at Steventon, thanks guys be booking you to come back very soon!!! Just back from a fantastic night at the Corn Exchange. Thank you for the music.. a great tribute. Amazing show at Weymouth Pavilion tonight. Thoroughly enjoyed it. Thank you so much for getting us all dancing tonight at the Kenton Theatre, Henley tonight.....yes, even in the balcony!!! Such fun, loved the show! Thank you for such a superb performance last night. It was a pleasure to have such a professional performance and organised get in and get out show. Feedback as the audience left last night was excellent so as agreed we will look at dates for autumn 2015. "A great evening and plenty of great feedback from the audience, hope to see you back here soon in Pwllheli! I went to your show at the Barnsley Metrodome last night... WOW! I was lucky enough to see ABBA in their heyday, and I've been looking forward to the gig since it was first announced. It was fantastic! The vocals and harmonies are just amazing, and deserving of the band that backed the girls. The costumes... also fantastic! It was a great night. The audience were involved from the first song to the last and the atmosphere was just like one long party. I've seen a number of ABBA trivute bands over the years and you are definitely the best. ABBA have left a fine musical legacy, and it's in good hands. The feedback we have been getting, is that everyone really enjoyed the fantastic, polished performance you gave us. Which is no surprise given the great night we had, you had virtually the whole audience up and dancing and kept them up there all night. We have had several of these type of shows over the last few years but we have never known people enthuse about them the way they have this time. You were all very friendly and helpful to us, your advice was priceless regarding how the show would work best and you put everyone at ease with your very approachable manner. 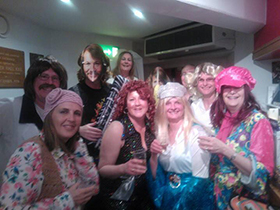 There cannot be a better Abba Show around and we would definitely recommend Gimme Abba to anyone who asks, please pass on all of our thanks to the whole crew who gave us a night to remember and we look forward to seeing you again soon. Brilliant gig in the Winterton Pavilion, last night. Everyone really enjoyed it, you involved the audience, every one of all ages dancing and the sound quality was excellent. Thank very much for an unforgettable show and catch you again sometime. 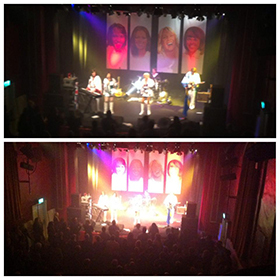 "Gimme Abba performed a superb show, a tribute to the look and sound of Abba. We had a thoroughly enjoyable evening at the Parkway Barnsley, with the audience up on their feet for most of it! I cannot praise the band highly enough – terrific harmonies, superb audience interaction and nice people to deal with too. We will definitely be seeing them again on our stage!" "Just a quick line to say Thank You for last Friday Night’s performance, It was Brilliant. It was also great to see you all again. We have had brilliant feedback from all our customers who are looking forward to seeing you again next year. We will be in contact soon to arrange booking you for next August 2014 if possible. Alternatively if want to send us over dates for July or August 2014 when you are available that would be great. Just a quick email. What a great show last night- very well received here & we would like to have you back again next year. Many Thanks for a fantastic evening & I hope you enjoyed it as much as we did. "Firstly we were gutted that we did not get to see you at the end of the evening, before you set off home, So thank you so much for the great show! We had a fantastic day and you guys just topped it off a treat! All of my guests have said what a brilliant do it was and just so glad we booked you guys. Thank you so very very much. I'm part of the Facilities Team who organize our events and I have already passed on your details to them! "Dear Lawrence. I just received feedback from The Gleneagles Hotel and the client whom you entertained last weekend. As you can see from the comments, the client was delighted with the entertainment. This hotel is one of the most prestigious venues in the country and as such, expectations are even higher than normal. I wanted to write and thank you all most sincerely for representing our Entertainers Agency in this most professional manner. It is something which we have come to expect from the calibre of your performance and professional behaviour but never take for granted. Please pass on a big thank you to the band!!!!!! they were so good, tongue in cheek and had a sense of humour and made it an exceptional, special night for me. Everyone totally enjoyed the night and the band. A big thanks....and would not hesitate to recommending and booking again. "Being the final night, Saturday's line-up was very special, serving up hits from the 1970s was the fabulous UK Tribute band Gimme ABBA who took us through the Swedish sensations' best-known hits." "Just wanted to say a huge THANK YOU!!!! for helping make our wedding day/ night perfect. Your talented performance was talked about for days and weeks after, I wish I could have bottled the wonderful happy atmosphere you all created. "Hi all. Wanted to drop you a line to thank you for making my party so special on Saturday 29th January. Thank you for your help and support both before and on the night, both Paul and I had a fantastic evening - we have received many thank you letters and comments from friends and family expressing that it was the 'best party' they had ever been to. You were a big part of the evening and contributed so much in people enjoying themselves. Your professionalism shone through. We have already passed your contact details to a couple of people who attended the party so hopefully you will get more bookings in the future. "Dear All, Came to see you at our Morecambe Ball earlier this year and we all had a fabulous night - The show was excellent ! - In fact, I had always thought that I personally wasn't a real Abba fan and yet I was on the dance floor all night. "Hi Lawrence. Just to say I got the chance to see you guys and I think the show was fantastic, It's taken me a while to find the time to check-out the band but was well worth the wait. I tell you what Lawrence I have been a pro musician for more years than I care to remember and have seen all the so called top Abba tribute bands; names censored, and they can't hold a candle to you guys, I think you have a very lively show mixed with humour, great musicianship and the vocals are bang on! I have checked out your web site, Its uplifting to see people with such a passion and professional attitude to all that they do. Thanks for the invite and am really looking forward to meeting you in the next few weeks, that says a lot coming from somebody who over the last 30 years as seen and done It all. "The band arrived on time, very friendly and helpful, we had a fantastic evening and the feed back as people left the event and since has been overwhelmingly very very positive, everybody enjoyed themselves! Will you please pass on our grateful thanks to the band for their participation in enabling us to raise £1800 for our chosen charity. 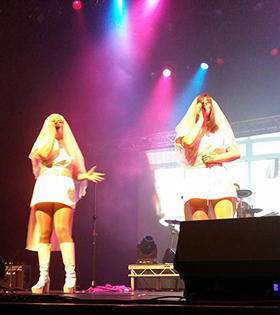 We would highly recommend this band to anyone who would like an Abba tribute group. 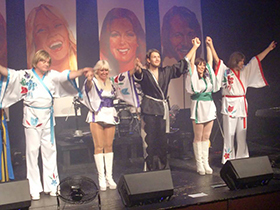 "Gimme Abba Stormed the Blake Theatre last Saturday (24th April), playing to a varied audience, all of whom were thoroughly entertained by the evening. Breaking open the show with the classic 'Waterloo' the groups performance was strong, giving the audience high expectations from the start. The whole first act was brought to life by the colourful and attention grabbing costumes, energetic dancing and brilliant keyboard and guitar skills. The second half kicked of with a lively rendition of (read more). We could have Sold-Out your concert twice over and all of the lucky attendees went away smiling and singing abba - it was amazing to see 350+ people up off their chairs dancing and swaying together to the music! Thanks again for fantastic show and we hope we will see you again in the future." Your third performance at the Britannia and as usual you delivered! Yet another first class performance, I know you travel all over the country night after night but your show is always as fresh has the last one... How do you do it? The reaction from the audience last night and the feedback received today have been fantastic. "Please pass on my thanks to Gimme Abba. They were fantastic and everyone said it was the most enjoyable Ball I had done in years!! They really made it a great night. "Hi Steve... Apologies for the delay in getting back to you our Programme of events have been rather hectic! Amanda Jade Griffiths - Programme Support Officer"
Thank you for Entertaining us on New Years Eve, great entertainment for all the ages who attended on the night! All the best for the future Adam Smart"
Could you please pass on my thanks and best wishes to the band and thanks again for a great evening. Thanks for the two great shows over the Christmas festivities, enjoyed by all! We are now putting together our 2009 Christmas shows, we would like to book the band for 3 shows in December 2009, could you please forward to me your available dates - and we will of course also be booking you guys periodically through-out 2009. Thank you for a fab night out, both my daughter Becky and Myself work @ the Holiday Inn and jumped at the chance of tickets. I was in the 'ABBA' fan club when I was in my teens! didn't ever get to see them but this made up for it. Enclosed a few pictures of our evening will forward more when Becky downloads hers. Thank you so much, we told the guys it was a great show but do please thank the band again for us! "The band were absolutely fantastic, they put on a great performance. 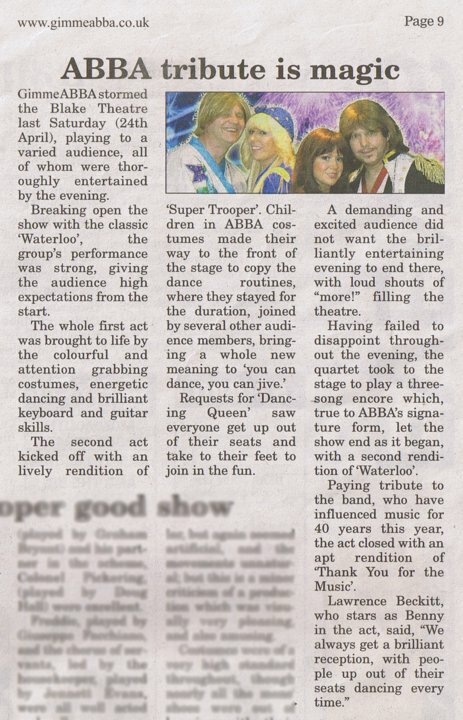 Please thank everyone concerned... everybody commented how good the show was, everyone we spoke to after the event said they really enjoyed it..
"Abba tribute, Gimme Abba performed all the favourite Abba songs that everyone knew and loved at the sold out Xscape, Castleford. They had a look and a sound like the icons themselves and with a stunning lightshow and costume changes this show was always guaranteed to be a performance not to be missed. " "Quite simply a professional, quality band with excellent harmonies. There surely cannot be a better tribute to Abba in this country or the world. Great stage show, great costumes and great people. If you are looking for something along these lines just sign them up there is no gamble at all, you'll simply get a night to remember. As I said on the night I cannot thank you enough for your professionalism especially with the problems we encountered. To be fair Gill from Spot On Entertainment spoke very highly of you not just as a band but as people and we weren't disappointed. The feedback from the people there was all positive and asked if we could get you back again. "We are only used to the top tributes at the Landmarc and you are certainly up there with the best, thank you for a superb show, hope to have you back in the near future. "Hope you guys enjoyed the show as much as we did, thanks a lot and we will see you next time. The Holte Suite Bar Manager"
Thanks for a great night, has you know we had a great turn out and everyone went away very happy, this is a show we will defiantly wish to repeat. "The Best Tribute Band yet! Whitby Town Football Club - Summer ball "
"Hello Lawrence, I would like to take this opportunity to thank you and all the band members for entertaining us last Wednesday, the event was great and everyone had a wonderful time and my mum was really pleased to see her favourite band arrive on stage! The music and light show was fantastic and you were so professional and courteous, Thanks again and send my best wishes to all the band members, and if any of you wish to come to Bramall Lane next season please give us a shout! "Just a short email to say a big 'Thank You' to the band for the fantastic performance of abba last Saturday, we sold all the tickets and everybody's been saying how much they enjoyed the show, the comment about everyone's fancy dress you made went down well and made all those people in 70s gear feel special and glad that they went to all the effort! Can you let me know if you are available for our clubs New Years Eve Show? " Everybody has commented on your performance, and that the night was a total success. 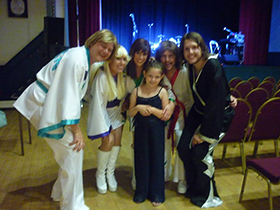 A few people had tears in their eyes when the girls got the disabled girl up on stage near the end, her face was a picture of happiness, I can only praise you and all the band members who went out of their way to make the night what it was, even down to running the Abba quiz for us. As we discussed, please let me have your available dates in December. Gavin Wagstaff - I was the Daft Looking Git in the Wig! "